FABULOUS 4 Bed, 4 Bath situated on large, wooded, cul-de-sac lot! 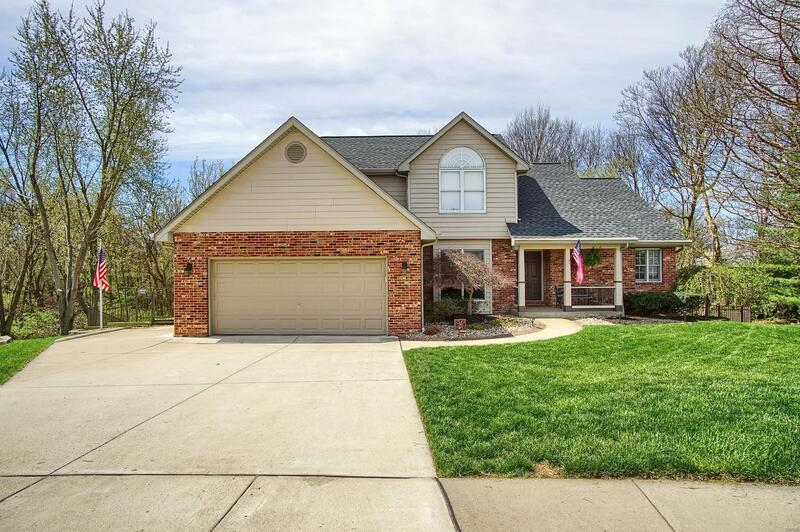 Living Rm boasts vaulted ceiling w/cozy brick surround fireplace; Dining w/elegant wainscoting, Kitchen w/tiled back splash, planning desk & atrium door in breakfast area leading to oversized Composite Deck ('18). Main floor Master w/cathedral ceiling; luxury master bath w/dual vanities, separate shower, jetted garden tub & walk-in closet. W/O Basement has Family & Game Areas w/wood burning stove & wiring for surround sound, 5th non-conforming Bedroom or Office w/built-in desk, walk-in cedar closet & 3/4 bath. Unfinished area 12 x 27 w/utility door perfect for workshop or yard & garage tools. Beautifully landscaped yard with landscape lighting & aluminum fencing. Many upgrades/updates - custom wood blinds, ceiling fans, crown molding, wood floors, whole house fan & security system. New roof, seamless guttering & gutter guards, GEO heat/air & 2 water heaters. 2 Car garage with extra parking pad.